Running the day to day operations in your business can be overwhelming. Aside from the bread and butter of what keeps your business going and the bills paid, there’s that ever expanding list of to-do’s that keeps rearing its ugly head. You are good at what you do, there is absolutely no question about that. And your to-do list is just a mundane list of tasks that you simply don’t have the time to get around to do. Sure, there are those couple of items that you may have to spend time researching before you can tackle. But that’s just it! It requires time!! Time that you simply keep running out of at the end of every day. I hear it every day. You start every morning with full intentions of tackling that to-do list. You set priorities, you may even pick your top 3 items to hit. Yet, the end of your day comes around and did you check anything off the list? And let’s be honest here, the end of your day is not 5 o’clock. The end of your day means you probably missed dinner with the family, a little league baseball game or happy hour with friends. Perhaps it’s time you consider hiring a VA, or Virtual Assistant. You’ve heard others talk about a VA, read about it in Entrepreneur magazine, and read article after article online. 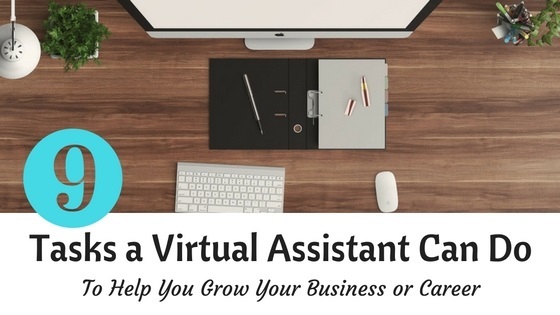 But, how can a Virtual Assistant help your business or career? What can a VA actually do for you? Just about anything. Each virtual assistant has their own areas of expertise, so there will be a need to search for one that meets your needs. You’re starting a business and you’re still working your 9 to 5… or is it a 7 to 6, plus sometimes weekends?? So clearly, you don’t have much time to work on getting your business up and running. A virtual assistant can do the leg work for you. You have the big idea, the big picture, the strategies. Jot them down, what tasks do you need for each to happen? Get that list to your virtual assistant. Provide the goal, the contractors, the timeline and have your VA manage it for you with occasional check ins. Meet once a week to update on progress, and provide more tasks. Before you know, you’ll be submitting your 2 week notice. Whether you have to do an analysis for work and simply need to gather information with some online research, or need product retailer competitor and pricing information or simply need to find the lead magnet software service available, a virtual assistant can do this for you. In fact, a virtual assistant may already know what the good lead magnet softwares are from working with other clients. All you need to do is provide the requirements for the research, where to and where not to look, and how many items you want to compare. Every business owner knows that the pudding is in growing your list. It’s crucial to send out a weekly or monthly newsletter with blog posts and articles to set yourself as the expert in your category, and ultimately, sell them your product and/or services. But yes, it takes time to put one together. A virtual assistant can help you put together a template and customize it at regular intervals (weekly or monthly) with your content, pictures and offers. Writing can be time consuming. You either need to take the time to put your thoughts on paper (er…keyboard), or you have to sort through your notes to compile a summary and make sense of it all, or you may even need to do some online research to find hard facts to prove your point. In any event, it takes time. And frankly, you might just not like to write. A virtual assistant can take care of this for you. A VA will have great resources for free stock photos for commercial use, in case you need a blog title and photos inserted into your blog. When you have a deadline but you have meetings back to back, or need to leave the office to attend your kid’s back to school night, or simply need to get some good sleep, call on your virtual assistant. Provide all your info, notes, pictures and perhaps even a preferred template to your virtual assistant and take the night off. Proof and provide edits and let your virtual assistant finalize it for you. Ever find yourself having to redesign your website, or more it to another platform? Yes, it may not be difficult. But moving over years’ worth of information in an orderly fashion to a new website is again…time consuming. Everybody’s doing it and frankly, it is a great way to stay in touch with your customers. You have tohang out where they’re at, right? And social media is where they’re at. A VA is a great resource to get your social media posts scheduled. Just provide your VA with the message, content, where to find the link, and what accounts to tag, and your VA will make it happen. Your VA will also be able to create a graphic to use for your social media post, come up with a strategy, and make suggestions for content that will be appropriate for your brand to share. When you find yourself spending way too much time reading and answering customer emails, or even manning a live chat, when you can be focusing on the big picture of your business, a VA might be a good idea. Especially when you’re just starting off and only need a few hours a week. It seems everyone is listening to a podcast these days. They’ve become super popular. And for those who have decided to launch a podcast…little did they know how much time it would take. It’s easy and there are a ton of tutorials out there. Again, a VA can help you schedule your guests, come up with your questions, edit the audio, write the show notes and launch on iTunes, Stitcher and any other podcast platform you use. There are VA’s that specifically focus on only doing podcast production. Before you know it, your VA will know your preferred working style, your processes and how you want things done, and will require less instruction. Once your VA is trained and up to speed, there’s no telling how many tasks and projects you can delegate. Many VA’s like myself, hold bachelor degrees. And rather than working a corporate 9 to 5, we’ve chosen to freelance from a home office. Don’t underestimate what a Virtual Assistant can do. It requires very little investment in comparison to hiring someone. You don’t have to provide insurance, workers compensation or equipment. Your VA has all the equipment necessary to work from home, and takes care of their own taxes. These are only some of the tasks and projects a Virtual Assistant can do, and those that I specialize in. But there are VAs with many other skills, and surely one to fit your needs. Have you worked with a virtual assistant? What tasks has your virtual assistant done for you, and what was the biggest benefit you found to working with a virtual assistant? Would love to learn what others are doing. Comment below, shoot me an email or leave a comment on my Facebook page.